Arkansas/Arkansaw is the first book to explain how Arkansas’s image began and how the popular culture stereotypes have been perpetuated and altered through succeeding generations. Brooks Blevins argues that the image has not always been a bad one. He discusses travel accounts, literature, radio programs, movies, and television shows that give a very positive image of the Natural State. 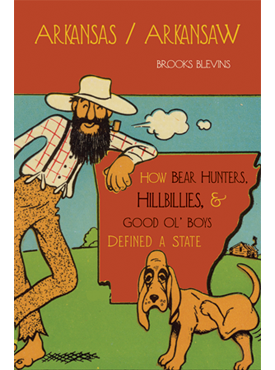 From territorial accounts of the Creole inhabitants of the Mississippi River Valley to national derision of the state’s triple-wide governor’s mansion to Li’l Abner, the Beverly Hillbillies, and Slingblade, Blevins leads readers on an entertaining and insightful tour through more than two centuries of the idea of Arkansas. One discovers along the way how one state becomes simultaneously a punch line and a source of admiration for progressives and social critics alike. Brooks Blevins is the Noel Boyd Associate Professor of Ozarks Studies at Missouri State University. He is the author of Cattle in the Cotton Fields, Hill Folks, and Lyon College, 1872–2002 and editor of Life in the Leatherwoods.